Harvey Lavan “Van” Cliburn, Jr., (pron. : /ˈklaɪbɜrn/; July 12, 1934 – February 27, 2013) was an American pianist who achieved worldwide recognition in 1958 at the age of 23, when he won the first quadrennial International Tchaikovsky Piano Competition in Moscow at the height of the Cold War. 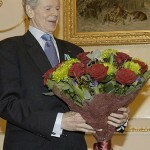 Van Cliburn toured domestically and overseas. He played for royalty, heads of state, and every U.S. president from Dwight D. Eisenhower to Barack Obama. His recording of Tchaikovsky’s Piano Concerto No. 1 was the first album by a classical artist to sell more than 1 million copies. 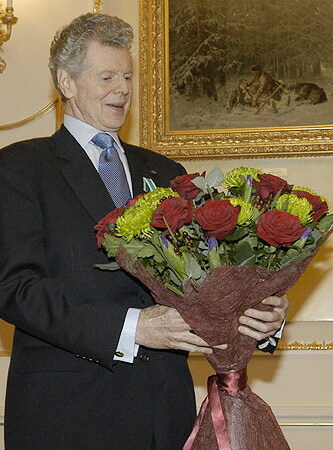 Cliburn received the Kennedy Center Honors in 2001. He was awarded the Presidential Medal of Freedom in 2003 by then President George W. Bush, and, in October 2004, the Russian Order of Friendship, the highest civilian awards of the two countries. He was also awarded the Grammy Lifetime Achievement Award the same year and played at a surprise 50th birthday party for United States Secretary of State Condoleezza Rice. He was a member of the Alpha Chi Chapter of Phi Mu Alpha Sinfonia, and was awarded the fraternity’s Charles E. Lutton Man of Music Award in 1962. He was presented a 2010 National Medal of Arts by President Barack Obama.